Taste test: I don't speak Spanish, but when I used babelfish to translate "Pollo alas Brasas" it came back with "chicken to live coals." So I think these are supposed to be grilled chicken flavored. Amazingly, that's exactly what these thin, crisp potato chips really did taste like. They were very tasty and loaded with flavor. 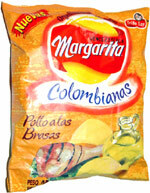 The good folks at Frito-Lay Colombia were even so kind as to pack a lot of these delicious chips into this small bag. A great find. Smell test: Wow, it definitely smells like chicken. It's really good. 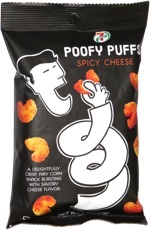 This snack was discovered by Josh Reynolds in Colombia. Review published .